Fried wholewheat pasta (was a leftover from dinner) with some leek, cabbage and chili, tamagoyaki, cherry tomatoes, sugar snap peas, Thai basil, some salad leaves, a piece of rhubarb cake and some grapes. I have a huge backlog of posts I didn’t get to write up recently. Hrm. I’ll try working on it in the next days. 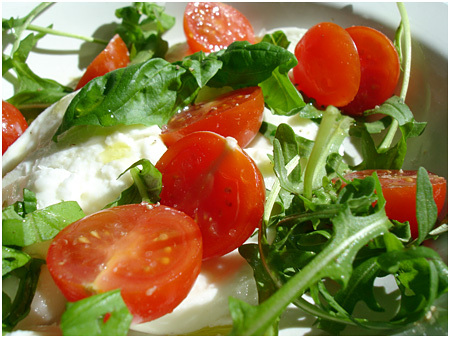 It’s best served with just some olive oil, salt and pepper, ripe tomatoes and possibly basil or rucola. 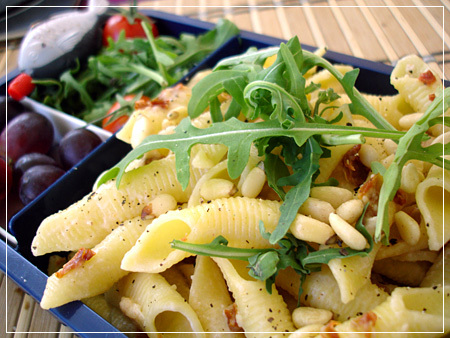 Back to the pasta bentos – penne (actually girandole) with creamy sundried tomato sauce, pine nuts and rucola. Some more rucola and cherry tomatoes in the back, a fishy with balsamico vinegar and some grapes as dessert. The recipe is stolen from a restaurant here – it’s one of my favourite dishes there. Chop the sundried tomaotes finely or puree them. Make a white (bechamel) sauce using the oil that the tomatos were pickled in as fat for the roux, drop the tomatoes in and cook for a bit so the sauce takes up the flavour. Cook pasta al dente. Rinse and toss with the sauce for a bit. Serve with dry roasted pine nuts, grated fresh parmesan (again: don’t use any if you don’t have fresh one!) and rucola on top. 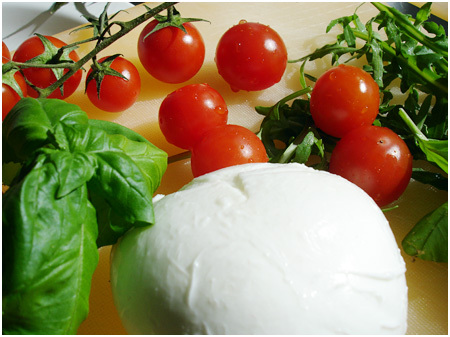 For non-vegetarians, the restaurant serves it with some slices of airdried parma ham. Not as colourful today, but rather comfort food. 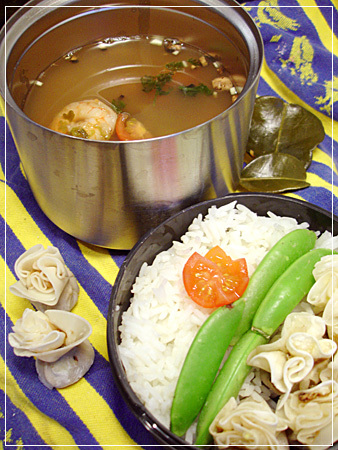 Tom Yum soup with prawns (I actually didn’t have the proper chili paste so it’s not as red as it should be), rice, some veggie wontons and a few sugar snap peas and a cherry tomato for decoration. …but then I had absolutely NO appetite for them at all. 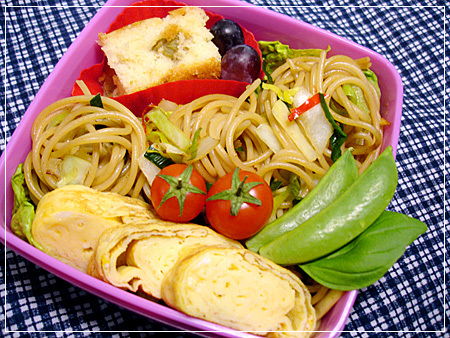 I’ll post a healthy, proper bento another day, promise! 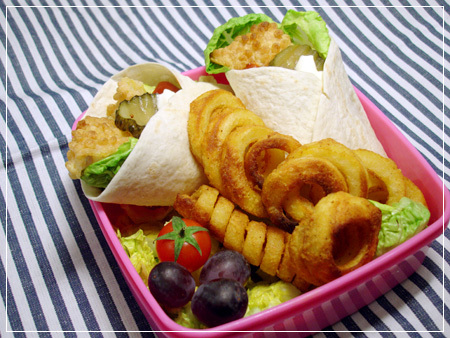 This one contains crispy fishsticks in a tortilla wrap with salad, pickles, aioli and ketchup, salad hearts, a few curly fries leftover from dinner, some grapes and a cherry tomato. Not shown: bottle of balsamico vinegar for the salad (I like my salad iwth just vinegar, no oil). Fish and fries are oven-baked from frozen. 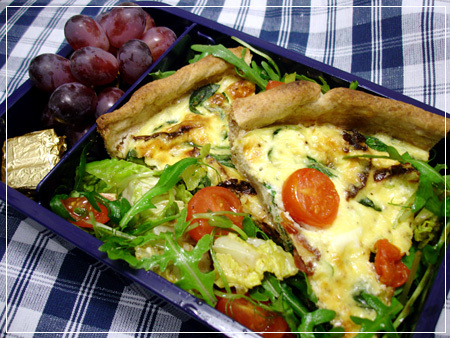 Spinach and ricotta quiche on mixed salad, red grapes and a few pieces of Black&Green’s organic chocolate wrapped in gold foil to keep it from being soaked in vinegar. Make a savoury pie shell (I used some olive oil instead of butter in a variation of my staple recipe, and it was rather nice). Prebake in a flat pie form. Filling: 3 eggs, a few tablespoons of Ricotta, salt and pepper, 1 packet of baby spinach, spring onions, sundried tomatoes, cherry tomato halves as decoration. Mix the eggs, ricotta and salt and pepper to taste. Blanch the baby spinach very quickly by putting it in a sieve and pouring some boiling water on it. Spread it in the form, add chopped spring onions and sundried tomatoes, cover with the egg-ricotta mix and add tomato halves as decoration. Ovenbake until it seems done, it goes rather quick since it’s so flat. 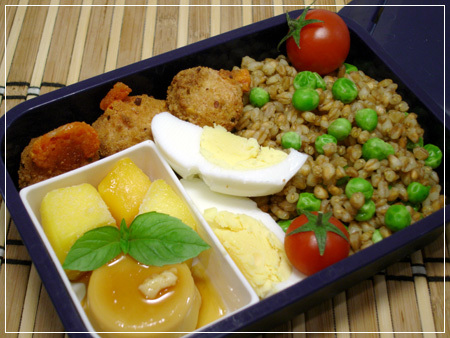 Boiled wheat and peas, hardboiled egg, cherry tomates, chili cheese bits (ovenbaked), a mini Crème Brulee (made from a mix with the help of an eggcup as form) and frozen mango pieces, Thai basil as decoration.